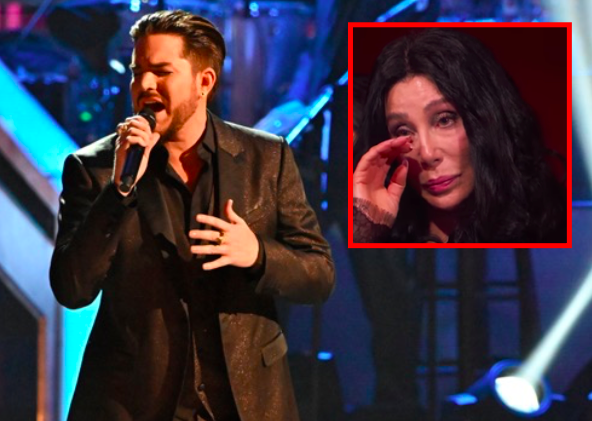 Adam Lambert left the whole room in tears with his emotional cover of Cher’s “Believe” performed at the 2018 Kennedy Center Honors, which aired last night on CBS. Seriously, the whole room. As well as living rooms across America.
.@adamlambert's incredible version of @Cher's "Believe" on #KennedyCenterHonors is proof that all of those of us who obsessed about him on American Idol can say, "We told you so." So there. The 41st annual celebration of the arts was held on December 2 and hosted by Gloria Estefan. It aired last night on CBS. In addition to Cher, the 2018 Honorees included none other than country music superstar Reba McEntire, composer and pianist Philip Glass, jazz saxophonist and composer Wayne Shorter, and the three co-creators of the hit Broadway musical Hamilton. Performers from the night included Cyndi Lauper and Kelly Clarkson among others. But it was Adam Lambert who stole the show and left everyone, including Cher, speechless. Believe In Words,but Cant seem 2.When Your senses are Overwhelmed All Can you feel with your ??. Gloria is a republican surprised Cher wasn’t triggered by that and had to boycott. J luckily for us all you don’t get to dictate what people say in the comments section. Btw how many sock puppets you got goin on there buddy? Anyone else’s political affiliation we need to know about so we can fact check? She’s not a Democrat and has never uttered anything in support against the Democrats. This led people to assume oh then she must be the other one. A Republican. As if there are only two parties that are people in. Some people aren’t either. And some people are Independents, Green, Libertarians. Cher and Gloria both have class unlike Trump. Brilliant. An unexpectedly reserved rendition, compared to his take during his run on ‘Idol’ (although, I like both covers). It was a very nice rendition indeed, but I wasn’t moved. It didn’t project the feeling she can. Aahhhh……Excuse me!!!!!! ‘Video NOT Available’….What is that????? Queerty muy ban and delete these types that advertise. I agree Elpillo, Queerty allows bots to post advertisement but if you say something wrong you get banned. So you know they “police” the site. I guess their “parent” company needs the money. Adam Lambert, one helluva entertainer. Like him or not, the man is talented. Really should have won Idol back in the day. Great tribute to Cher, a true Idol and Diva. Not this time! Beautiful to a supernatural, unearthly level. Soooo….was Trump at the Kennedy Centre Awards? Hmmmm? He sang it in her key. Very impressive. When’s he gonna have a hit? Her own record company will not support her. Then for some reason, her singles always do great on the dance club singles chart (most times reaching #1) but radio DJ’s will not put her songs on their stations so the hits can be on the HOT 100. This is directly the result of WB not pushing and promoting her singles. Many from the BELIEVE album had millions of views on You Tube but they weren’t even released as singles by WB. She owes them one more album, then hopefully she signs with another label. Really really good. Great set of pipes. It looked like the Diva approved of Glambert’s cover of Beleive so that is good.